© 2017 Dixit et al. Surflex-Docking method was used to study binding modes of the compounds at the active site of the enzyme enoyl ACP reductase from Mycobacterium tuberculosis (M. tuberculosis), which plays an important role in FAS-II biosynthetic pathway of M. tuberculosis and also it is an important target for designing novel anti-TB agents. Among the synthesized compounds, compounds 4g and 4i showed H-bonding interactions with MET98, TYR158 and co-factor NAD+, all of which fitted well within the binding pocket of InhA. Also, these compounds have shown the same type of interaction as that of 4TZK ligand. The compounds were further evaluated for preliminary anti-TB activities against M. tuberculosis H37Rv strain. Some compounds were also screened for their mammalian cell toxicity using human lung cancer cell-line (A549) that was found to be nontoxic. Keywords: Surflex docking, Cytotoxicity, Antitubercular activity, Pyrazoline carbaldehyde. Innovations on novel drugs for the treatment of tuberculosis (TB) have generated novel concepts in the field of medicinal chemistry, particularly keeping in mind on multi-drug resistance and high mortality rate [1, 2]. Presence of Human Immunodeficiency Virus (HIV), leading to Acquired Immune Deficiency Syndrome (AIDS) has provoked the occurrence of TB, which in turn caused the deaths among HIV-infected patients caused by co-infection with Mycobacetrium tuberculosis (M. tuberculosis), thereby increasing the diminution of immune system . There are several drugs in the market, which are currently in use, such as isoniazid (INH), rifampicin, pyrazinamide and delamanid as these possess a nitrogen atom in their ring structures viz., pyridine, piperazine, piperidine and pyrazine with azomethine and aryloxy moieties, which constitute their core structural features. The association of multifunctional FAS-I system (fatty acid synthase type I) originate from eukaryotes provides a good opportunity for its selective inhibition, but it is relatively different from the individual enzymes of the bacterial fatty acid synthase type II system (FAS-II). Of the striking antimicrobial drug targets, FAS-II pathway has gained much attention in the modern era for developing INH based new chemical entities [4-7]. NADH-dependent enoyl acyl carrier protein (ENR) reductase encoded by Mycobacterium gene InhA is the key catalyst involved in mycolic acid biosynthesis in FAS-II patway. Earlier reports have recognized that InhA is the primary target for INH , a leading drug used for the treatment of TB for over 40 years. Reports have suggested that the formed INH-NADH adduct by the action of KatG (catalase-peroxide enzyme) on INH to form an acyl radical, which in turn covalently binds to NADH, acts as an effective inhibitor of InhA and other InhA inhibitors such as triclosan, pyrazole derivatives, diazaborines and indole-5-amides [9-13]. Chalcones have been studied extensively for their wide variety of pharmacological activities as antifungal , antimitotic , antitubercular , antitumor and antioxidant , antimalarial  and pyrazolines as these have shown a wide range of biological activities as anti-inflammatory [19, 20], antitumor , antitubercular , and monoamino oxidase inhibitor . Pyrrole is also a vital part of the plant and animal origin as a hemin and vitamin B12 in animal cells, subunit of chlorophyll in plants. Earlier, pyrrole derivatives have shown in vitro anti-TB activity [23, 24], but recently, much research has occurred on anti-TB drug designing using pyrroles as the core structure in the synthesis and in silico studies [25-29], which suggests the significance of pyrrole derivatives as anti-TB agents. This has encouraged us to carry out a detailed study on the design and synthesis of new pyrrole derivatives as useful anti-TB agents. In our earlier reports [16, 25], we have designed several inhibitors of InhA using fundamental core as a pyrrole ring with different pharmacophores in a single molecular skeleton along with Two- and Three-dimensional QSAR studies. Herein, we report the synthesis of pyrrole derivatives, which act as inhibitors of ENR enzyme along with their in vitro anti-TB studies. Some of the drugs that are under clinical or preclinical trials that are considered to synthesize new derivatives following the Pall-Knorr pyrrole synthesis are depicted in Fig. (1). Molecular docking studies have been employed to show the correlation between in silico results and in vitro analysis to find ENR as a prospective target of pyrrolyl-pyrazoline carbaldehyde derivatives. Fig. (1). Design concept for the synthesis of titled compounds. Melting points of the synthesized compounds were determined using digital melting point apparatus (Shital, Mumbai) and are uncorrected. FTIR spectra were recorded on a Bruker FTIR spectrophotometer using KBr pellets. The 1H and 13C NMR spectra were recorded on a Bruker AVANCE II at 400 and 100/75 MHz, respectively; chemical shifts are expressed in parts per million (δ ppm) relative to tetramethylsilane. Abbreviations used to describe the peak patterns are: (b) broad, (s) singlet, (d) doublet, (t) triplet, and (m) multiplet. Mass spectra (MS) were recorded in a JEOL GCMATE II GC-Mass spectrometer and Schimadzu QP 20105 GC-Mass spectrometer. Analytical thin-layer chromatography (TLC) was performed on precoated TLC sheets of silica gel 60 F254 (Merck, Darmstadt, Germany) visualized by long- and short-wavelength UV lamps. Chromatographic purifications were performed on Merck silica gel (70-230 mesh). To a stirred alcoholic solution of pyrrolyl acetophenone 1 (1.57g, 0.01 mol), an alcoholic solution of substituted aldehydes 2(a-o) (0.01 mol) and 40% sodium hydroxide (8 mL) were added with continuous stirring for 24-30 h. The resultant mixture was poured onto crushed ice and neutralized with hydrochloric acid. The separated solid was filtered, washed with water, dried and purified by column chromatography on a silica gel with ethyl acetate/petroleum ether (6:4) mixture as the eluent. Similar procedure was used to synthesize compounds (3b-o) . A mixture of chalcones (3a) (0.01 mmol), hydrazine hydrate 99% (0.01 mmol) and formic acid (5 mL) was refluxed for 18 h to complete the reaction as confirmed by TLC. Then the reaction mixture was cooled to ambient temperature; the separated solid was filtered, washed with cold ethanol, dried and purified by column chromatography on a silica gel with ethyl acetate/petroleum ether (6:4) mixture as the eluent to afford the compounds in high purity with good yields. The same procedure was used to synthesize compounds (4b-o). (Yield 85%). mp 178-180oC; FTIR (KBr): υ, cm-1 3138, 3029 (Ar-H), 1688 (C=O), 1607 (C=N); 1H NMR (400 MHz, CDCl3): δ, ppm: 3.28 (dd, J=4.88, 4.84 Hz, 1H, pyrazoline-C4-Ha), 3.88 (dd, J=11.80, 11.76 Hz, 1H, pyrazoline-C4-Hb), 5.60 (dd, J=4.80 Hz, 1H, pyrazoline-C5-Hx), 6.41 (t, 2H, pyrrole-C3, C4-H), 7.17 (t, 2H, pyrrole-C2, C5-H), 7.28-7.49 (m, 7H, bridging phenyl-C2, C6 and ph-C2, C3, C4, C5, C6-H), 7.83 (t, 2H, bridging phenyl-C3, C5-H), 9.00 (d, J = 0.72 Hz, 1H, -CHO); 13C NMR (100 MHz, CDCl3): δ, ppm: 159.87, 154.62, 142.17, 133.60, 129.48, 128.66, 127.97, 120.14, 111.25, 55.71, 39.26; MS (EI): m/z = found 315 [M+]; calcd. 315.14. (Yield 70%). mp 168-170oC; FTIR (KBr): υ, cm-1 3138, 3030 (Ar-H), 1667 (C=O), 1527 (C=N); 1H NMR (400 MHz, CDCl3): δ, ppm: 3.20 (dd, J=4.96, 5.00 Hz, 1H, pyrazoline-C4-Ha), 3.84 (dd, J=11.80, 11.84 Hz, 1H, pyrazoline-C4-Hb), 5.53 (dd, J=4.92 Hz, 1H, pyrazoline-C5-Hx), 6.38 (t, 2H, pyrrole-C3, C4-H), 7.14 (t, 2H, pyrrole-C2, C5-H), 7.19 (d, J=1.72 Hz, 2H, chloroph-C3, C5-H), 7.30 (t, 2H, chloroph-C2, C6-H), 7.46 (d, J=8.68 Hz, 2H, bridging phenyl-C2, C6-H), 7.78 (d, J=1.68 Hz, 2H, bridging phenyl-C3, C5-H), 8.94 (d, J=0.36 Hz, 1H, -CHO); 13C NMR (100 MHz, CDCl3): δ, ppm: 160.01, 142.06, 132.06, 129.06, 128.03, 125.67, 120.08, 111.29, 59.14, 42.61; MS (EI): m/z = found 349 [M+]; calcd. 349.10. (Yield 70%). mp 163-165oC; FTIR (KBr): υ, cm-1 3108, 3066 (Ar-H), 1684 (C=O), 1528 (C=N); 1H NMR (400 MHz, CDCl3): δ, ppm: 3.12 (dd, J=5.08, 5.12 Hz, 1H, pyrazoline-C4-Ha), 3.97 (dd, J=11.80 Hz, 1H, pyrazoline-C4-Hb), 5.92 (dd, J=5.08 Hz, 1H, pyrazoline-C5-Hx), 6.38 (t, 2H, pyrrole-C3, C4-H), 7.06 (dd, 1H, chlorophenyl-C6-H), 7.13 (t, 2H, pyrrole-C2, C5-H), 7.21 (t, 1H, chloroph-C5-H), 7.40-7.45 (m, 3H, chloroph-C4-H and bridging phenyl-C2, C6-H), 7.75-7.78 (m, 2H, bridging phenyl-C3, C5-H), 9.04 (d, J=0.36 Hz, 1H, -CHO); 13C NMR (100 MHz, CDCl3): δ, ppm: 160, 155.17, 142.34, 133.95, 129.90, 128.15, 127.85, 127.63, 120.01, 111.37, 57.32, 41.57. (Yield 75%). mp 228-230oC; FTIR (KBr): υ, cm-1 3080, 3050 (Ar-H), 1665 (C=O), 1525 (C=N); 1H NMR (400 MHz, CDCl3) δ ppm: 3.11 (dd, J=5.24, 5.20 Hz, 1H, pyrazoline-C4-Ha), 3.94 (dd, J=11.80, 11.84 Hz, 1H, pyrazoline-C4-Hb), 5.85 (dd, J=5.16, 5.24 Hz, 1H, pyrazoline-C5-Hx), 6.38 (t, 2H, pyrrole-C3, C4-H), 7.08 (d, J=8.40 Hz, 1H, chloroph-C6-H), 7.14 (t, 2H, pyrrole-C2, C5-H), 7.2-7.25 (m, 1H, chloroph-C5-H), 7.43-7.45 (m, 3H, chloroph-C3-H and bridging phenyl-C2, C6-H), 7.75-7.78 (m, 2H, bridging phenyl-C3, C5-H), 9.02 (s, 1H, -CHO); MS (EI): m/z = found 383 [M+]; calcd. 383.06. (Yield 70%). mp 208-210oC; FTIR (KBr): υ, cm-1 3118, 3099 (Ar-H), 1667 (C=O), 1525 (C=N); 1H NMR (400 MHz, CDCl3) δ ppm: 3.40 (dd, J=8.32 Hz, 1H, pyrazoline-C4-Ha), 3.78 (dd, J=12.84 Hz, 1H, pyrazoline-C4-Hb), 6.21-6.26 (m, 1H, pyrazoline-C5-Hx), 6.39 (t, 2H, pyrrole-C3, C4-H), 7.15 (t, 2H, pyrrole-C2, C5-H), 7.20 (d, J=8.04 Hz, 1H, chloroph-C4-H), 7.28-7.48 (m, 4H, chloroph-C3, C5-H and bridging phenyl-C2, C6-H), 7.78-7.82 (m, 2H, bridging phenyl-C3, C5-H), 8.89 (d, J=1.04 Hz, 1H, -CHO); 13C NMR (100 MHz, CDCl3): δ, ppm: 159.99, 154.67, 142.30, 139.05, 134.26, 129.26, 128.12, 127.20, 120.08, 111.35, 58.56, 42.45. (Yield 60%). mp 148-150oC; FTIR (KBr): υ, cm-1 3142, 3051 (Ar-H), 1686 (C=O), 1527 (C=N); 1H NMR (400 MHz, CDCl3): δ, ppm: 3.23 (dd, J=4.84 Hz, 1H, pyrazoline-C4-Ha), 3.83 (dd, J=11.76 Hz, 1H, pyrazoline-C4-Hb), 5.54 (dd, J=5.00, 4.68 Hz, 1H, pyrazoline-C5-Hx), 6.38 (t, 2H, pyrrole-C3, C4-H), 7.13-7.16 (m, 6H, pyrrole-C2, C5-H and methylph-C2, C3, C5, C6-H), 7.43-7.46 (m, 2H, bridging phenyl-C2, C6-H), 7.77-7.80 (m, 2H, bridging phenyl-C3, C5-H), 8.95 (d, J=0.68 Hz, 1H, -CHO); 13C NMR (100 MHz, CDCl3): δ, ppm: 160.24, 155.01, 142.49, 142.26, 131.19, 130.43, 129.96, 128.17, 124.82, 120.21, 111.33, 64.91, 42.61, 29.70; MS (EI): m/z = found 329 [M+]; calcd. 329.40. (Yield 70%). mp 112-114oC; FTIR (KBr): υ, cm-1 3136, 3075 (Ar-H), 1671 (C=O), 1529 (C=N); 1H NMR (400 MHz, CDCl3): δ, ppm: 3.24 (dd, J=4.84 Hz, 1H, pyrazoline-C4-Ha), 3.74-3.82 (m, 4H, pyrazoline-C4-Hb and -OCH3), 5.52 (dd, J=4.76, 4.72 Hz, 1H, pyrazoline-C5-Hx), 6.38 (t, 2H, pyrrole-C3, C4-H), 6.84-6.88 (m, 2H, methoxyph-C3, C5-H), 7.14 (t, 2H, pyrrole-C2, C5-H), 7.17-7.21 (m, 2H, methoxyph-C2, C6-H), 7.43-7.46 (m, 2H, bridging phenyl-C2, C6-H), 7.77-7.80 (m, 2H, bridging phenyl-C3, C5-H), 8.94 (d, J=0.92 Hz, 1H, -CHO); 13C NMR (100 MHz, CDCl3): δ, ppm: 160.01, 159.35, 154.83, 142.16, 132.79, 128.10, 127.06, 120.05, 114.43, 111.30, 58.69, 55.30, 42.54; MS (EI): m/z = found 345 [M+]; calcd. 345.15. (Yield 70%). mp 158-160oC; FTIR (KBr): υ, cm-1 3131, 3073 (Ar-H), 1668 (C=O), 1527 (C=N); 1H NMR (400 MHz, CDCl3) δ ppm: 3.24 (dd, J=4.84, 4.88 Hz, 1H, pyrazoline-C4-Ha), 3.77-3.82 (m, 4H, pyrazoline-C4-Hb and -OCH3), 5.54 (dd, J=4.80, 4.76 Hz, 1H, pyrazoline-C5-Hx), 6.39 (t, 2H, pyrrole-C3, C4-H), 6.78-6.86 (m, 3H, methoxyph-C2, C4, C6-H), 7.14 (t, 2H, pyrrole-C2, C5-H), 7.26 (t, 1H, methoxyph-C5-H), 7.43-7.46 (m, 2H, bridging phenyl-C2, C6-H), 7.76-7.80 (m, 2H, bridging phenyl-C3, C5-H), 8.98 (d, J=0.92 Hz, 1H, -CHO); 13C NMR (100 MHz, CDCl3): δ, ppm: 160.03, 154.79, 142.16, 130.20, 128.10, 120.07, 119, 113.18, 111.28, 59.06, 55.26, 42.63; MS (EI): m/z = found 345 [M+]; calcd. 345.15. (Yield 70%). mp 160-162oC; FTIR (KBr): υ, cm-1 3106, 3011 (Ar-H), 1671 (C=O), 1527 (C=N); 1H NMR (400 MHz, CDCl3): δ, ppm: 3.13 (dd, J=4.92 Hz, 1H, pyrazoline-C4-Ha), 3.69-3.82 (m, 7H, pyrazoline-C4-Hb and -2OCH3), 5.73 (dd, J=4.88, 4.80 Hz, 1H, pyrazoline-C5-Hx), 6.38 (t, 2H, pyrrole-C3, C4-H), 6.45 (dd, J=2.32, 2.52 Hz, 1H, methoxyph-C3-H), 6.48 (d, J=2.32 Hz, 1H, methoxyph-C5-H), 7.03 (d, J=8.36 Hz, 1H, methoxyph-C6-H), 7.14 (t, 2H, pyrrole-C2, C5-H), 7.41-7.45 (m, 2H, bridging phenyl-C2, C6-H), 7.76-7.79 (m, 2H, bridging phenyl-C3, C5-H), 8.99 (d, J=0.80 Hz, 1H, -CHO); 13C NMR (100 MHz, CDCl3): δ, ppm: 160.67, 160.04, 157.27, 155.67, 141.45, 128.45, 127.12, 120.43, 119.01, 111.19, 104.24, 99.22, 55.49, 55.40, 55.10, 41.68. (Yield 70%). mp 133-135oC; FTIR (KBr): υ, cm-1 3141, 3101 (Ar-H), 1679 (C=O), 1521 (C=N); 1H NMR (400 MHz, CDCl3) δ ppm: 3.26 (dd, J=4.92 Hz, 1H, pyrazoline-C4-Ha), 3.76-3.98 (m, 7H, pyrazoline-C4-Hb and -2OCH3), 5.53 (dd, J=4.88, 3.96 Hz, 1H, pyrazoline-C5-Hx), 6.39 (t, 2H, pyrrole-C3, C4-H), 6.77 (s, 1H, methoxyph-C6-H), 6.82 (s, 2H, methoxyph-C2, C5-H), 7.15 (t, 2H, pyrrole-C2, C5-H), 7.45-7.47 (m, 2H, bridging phenyl-C2, C6-H), 7.79-7.81 (m, 2H, bridging phenyl-C3, C5-H), 8.97 (d, J=0.88 Hz, 1H, -CHO); 13C NMR (100 MHz, CDCl3): δ, ppm: 160.08, 154.86, 148.90, 142.21, 132.20, 128.10, 120.08, 118.99, 117.88, 111.67, 109.11, 58.97, 56, 55.97, 42.64; MS (EI): m/z = found 375 [M+]; calcd. 375.16. (Yield 70%). mp 123-125oC; FTIR (KBr): υ, cm-1 3144, 3070 (Ar-H), 1664 (C=O), 1526 (C=N); 1H NMR (400 MHz, CDCl3): δ, ppm: 3.22 (dd, J=4.92, 4.88 Hz, 1H, pyrazoline-C4-Ha), 3.85 (dd, J=11.80 Hz, 2H, pyrazoline-C4-Hb), 5.55 (dd, J=4.80, 4.84 Hz, 1H, pyrazoline-C5-Hx), 6.40 (dd, J=2.20, 3.24 Hz, 2H, pyrrole-C3, C4-H), 7.01-7.06 (m, 2H, fluoroph-C3, C5-H), 7.13-7.16 (m, 2H, pyrrole-C2, C5-H), 7.22-7.26 (m, 2H, fluoroph-C2, C6-H), 7.44-7.47 (m, 2H, bridging phenyl-C2, C6-H), 7.77-7.80 (m, 2H, bridging phenyl-C3, C5-H), 8.95 (d, J=0.72 Hz, 1H, -CHO); 13C NMR (100 MHz, CDCl3); δ, ppm: 163.96, 160.77, 154.74, 142.28, 136.43, 128.12, 127.85, 120.07, 115.82, 111.34, 58.50, 42.54; MS (EI): m/z = found 313 [M+]; calcd. 313.13. (Yield 70%). mp 140-142oC; FTIR (KBr): υ, cm-1 3106, 2923 (Ar-H), 1672 (C=O), 1526 (C=N); 1H NMR (400 MHz, CDCl3): δ, ppm: 1.25 (s, 1H, -CH(CH3)2), 3.12 (dd, J=4.92, 1H, pyrazoline-C4-Ha), 3.68-3.83 (m, 7H, pyrazoline-C4-Hb and –CH(CH3)2), 5.73 (dd, J=4.84, 1H, pyrazoline-C5-Hx), 6.38 (dd, J=2.24, 2.76 Hz, 2H, pyrrole-C3, C4-H), 6.41-6.47 (m, 2H, isopropylph-C3, C5-H), 7.00-7.19 (m, 4H, pyrrole-C2, C5-H and isopropylph-C2, C6-H), 7.41-7.45 (m, 2H, bridging phenyl-C2, C6-H), 7.76-7.79 (m, 2H, bridging phenyl-C3, C5-H), 8.99 (d, J=0.92 Hz, 1H, -CHO); 13C NMR (100 MHz, CDCl3); δ, ppm: 160.06, 155.72, 142.01, 128.43, 127.13, 125.64, 120.43, 111.28, 58.92, 42.58, 33.78, 23.88; MS (EI): m/z = found 357 [M+]; calcd. 357.18. (Yield 75%). mp 168-170oC; FTIR (KBr): υ, cm-1 3138, 3100 (Ar-H), 1670 (C=O), 1524 (C=N); 1H NMR (400 MHz, CDCl3): δ, ppm: 3.21 (dd, J=5.00 Hz, 1H, pyrazoline-C4-Ha), 3.84 (dd, J=11.84 Hz, 1H, pyrazoline-C4-Hb), 5.52 (dd, J=4.96, 4.80 Hz, 1H, pyrazoline-C5-Hx), 6.38 (t, 2H, pyrrole-C3, C4-H), 7.13-8.12 (m, 10H, pyrrole-C2, C5, bromoph-C2, C4, C5, C6-H and bridging phenyl-C2, C3, C5, C6-H), 8.96 (d, J=0.88 Hz, 1H, -CHO); 13C NMR (100 MHz, CDCl3): δ, ppm: 160.04, 154.73, 142.93, 142.31, 133.29, 131.24, 128.76, 124.44, 123.16, 120.06, 111.71, 58.56, 42.50. (Yield 78%). mp 128-130oC; FTIR (KBr): υ, cm-1 3058 (Ar-H), 1678 (C=O), 1524 (C=N); 1H NMR (400 MHz, CDCl3) δ ppm: 3.23 (dd, J=4.84, 4.88 Hz, 1H, pyrazoline-C4-Ha), 3.83 (dd, J=11.76 Hz, 1H, pyrazoline-C4-Hb), 5.55 (dd, J=4.80, 4.76 Hz, 1H, pyrazoline-C5-Hx), 6.38 (t, 2H, pyrrole-C3, C4-H), 6.93-7.83 (m, 15H, pyrrole-C2, C5, phenoxyph-C2, C4, C5, C6, C7, C8, C9, C10, C11-H and bridging phenyl-C2, C3, C5, C6-H), 8.97 (d, J=0.84 Hz, 1H, -CHO); 13C NMR (100 MHz, CDCl3): δ, ppm: 160, 154.77, 142.16, 137.79, 129.71, 128.09, 125.64, 120.07, 119, 111.28, 58.96, 42.61. (Yield 80%). mp 152-154oC; FTIR (KBr): υ, cm-1 3140, 3117 (Ar-H), 1670 (C=O), 1524 (C=N); 1H NMR (400 MHz, CDCl3): δ, ppm: 3.53 (dd, J=5.04 Hz, 1H, pyrazoline-C4-Ha), 3.68 (dd, J=11.60 Hz, 1H, pyrazoline-C4-Hb), 5.67 (dd, J=5.00 Hz, 1H, pyrazoline-C5-Hx), 6.33-6.39 (m, 4H, pyrrole-C3, C4-H and furan-C3, C4-H), 7.14-7.17 (m, 2H, pyrrole-C2, C5-H) 7.33 (dd, J=0.64, 0.60 Hz, 1H, furan- C5-H), 7.44-7.47 (m, 2H, bridging phenyl-C2, C6-H), 7.78-7.82 (m, 2H, bridging phenyl-C3, C5-H), 8.90 (d, J=0.88 Hz, 1H, -CHO); 13C NMR (100 MHz, CDCl3): δ, ppm: 160.04, 154.97, 150.90, 142.36, 142.21, 128.12, 120.04, 111.36, 110.65, 108.17, 52.54, 38.47; MS (EI): m/z = found 305 [M+]; calcd. 305.12. Sybyl package was used to draw 3D structures (Tripos Associates, St. Louis, MO, USA) . Tripose force field was used for geometric optimization  using a distance dependent-dielectric function, energy gradient of 0.001 kcal/mol and MMFF94 as the electrostatics. Repeated molecular dynamics-based simulated annealing approach was implemented for the conformational analyses of all the 15 compounds. Molecules were heated up to 1000 K within 2000 fs, held at this temperature for 2000 fs and annealed to 0 K for 10,000 fs using an exponential annealing function. By employing this procedure, 100 conformations were sampled out during the 100 cycles to account for conformational flexibility to find the most likely stable conformations. All the conformations were minimized with Tripos force field and atomic charges were calculated using MMFF94 (Merck Molecular Force Field) method. 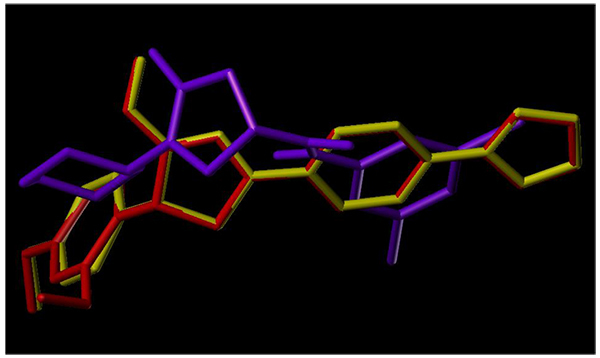 Molecular docking was performed to elucidate the type of binding of the compounds to afford uncomplicated information for further structural optimization. Surflex-Dock that adopted an experimental scoring function and a patented searching engine [32, 33] was employed in molecular docking studies. The crystal structure of M. tuberculosis enoyl reductase (InhA) complexed with 1-cyclohexyl-N-(3,5-dichlorophenyl)-5-oxopyrrolidine-3-carboxamide (PDB ID 4TZK, 1.62 Å X-ray resolution) was downloaded from the Brookhaven Protein Database (PDB http://www.rcsb.org/pdb). 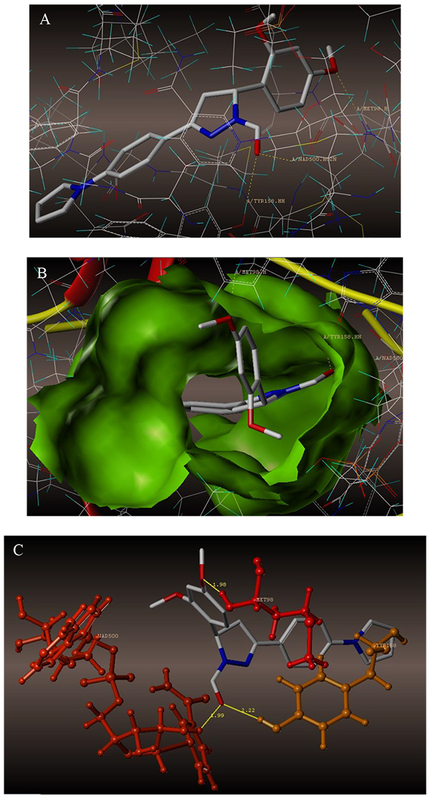 During the preparation of protein for docking study, ligands and water molecules present in the crystal structure were removed (except co-factor NAD+), then the enzyme 4TZK was assigned with polar hydrogens and united atom Amber7 FF99. Then, ligand-based mode was used to produce the “protomol”, keeping the threshold and bloat parameters at their default values of 0.50 and 0 Å all the inhibitors were docked within the prepared protein. Interaction mode of the ligand present in the crystal structure was used as a standard docked model against 4TZK PDB. The maximum of 20 numbers of maximum orientations per ligand was set with no constraints to perform molecular docking. Docking complex was believed to show the ligand-receptor interactions, which was selected based on three criteria: (i) docking score of the orientation possessed the highest docking score, (ii) orientation of aromatic rings of the ligand into the active site in a similar manner with the co-crystallized ligand orientations, and (iii) preservation of H-bonding interactions with Tyr158 and Co-factor NAD+. For comparative study of the designed molecules, the following parameters were estimated using the C-Score module of the Sybyl-X 2.0, D_score , PMF_score , G_score  and Chem_score . Microplate almar blue assay method was used to study the inhibition of M. tuberculosis H37Rv of all the synthesized compounds . The 96 wells containing plate charged with 100 mL of Middlebrook 7H9 broth and serial dilution of compounds with the drug concentrations of 0.2, 0.4, 0.8, 1.6, 3.125, 6.25, 12.5, 25, 50 and 100 mg/mL were added directly on the plate, sealed with parafilm and incubated for 5 days at 37o C. Then a mixture (1:1) of almar blue reagent and 10% Tween 80 (25 mL) were added to the plate and incubated for 24 h. Bacterial growth was interpreted by the development of pink color, while blue color suggests no bacterial growth. The MIC, defined as the lowest drug concentration, prevented the color change from blue to pink. Table 1 reveals anti-TB activity data expressed in MIC. Table 1. In vitro evaluation of antitubercular activity. Cellular conversion of MTT [3-(4,5-dimethylthiazo-2-yl)-2,5-diphenyl-tetrazolium bromide] into a formazan product  was used to estimate cytotoxic activity (IC50) of some of the compounds against cell-line A549 (lung adenocarcinoma) up to concentrations of 100 µg/mL using 5×103cells/well in a 96-well flat-bottom micro plate and maintained at 370C in 95% humidity and 5% CO2 for overnight using paclitaxel as the positive control. The IC50 values are the averages (± SEM) of three independent experiments, which are presented in Table 2. Table 2. MTT-based cytotoxicity activity of selected compounds at 100 µg/mL against human lung cancer cell line A549. Synthesis of all the compounds was carried out as depicted in Scheme (1). The Paal-Knorr synthesis involved the reaction of diketone like 2,5-dimethoxy tetrahydrofuran with amine, which is among the most conventional method for the synthesis of heterocyclic pyrrole ring. Hence, (4-pyrrol-1-yl)acetophenone (1) was obtained by forming pyrrole ring using the amino group present at the para- position of aromatic ring of 4-amino acetophenone in the presence of dried glacial acetic acid. The required key intermediates viz., chalcones (3a-o) were synthesized using Claisen-Schmidt condensation reaction between (4-pyrrol-1-yl)acetophenone (1) and substituted aldehydes (2a-o) in the presence of 40% alcoholic sodium hydroxide. Thus, synthesized chalcones (3a-o) were then cyclized to pyrazolyl carbaldehyde (4a-o) in a solvent free atmosphere by treating with hydrazine hydrate and formic acid. All the synthesized compounds were characterized by FTIR, 1H NMR, 13C NMR and mass spectroscopy. FTIR showed the presence of carbonyl and C=N groups as strong absorption bands in the regions 1664-1688 cm-1 and 1521-1607 cm-1, respectively. In 1H NMR spectra resonating signals of formyl group (-CHO), protons are observed as doublets in the range δ 8.89-9.04 ppm. The pyrazoline protons at the 4-H position appeared as two doublet of doublet/multiplet from δ 3.11-3.97 and that of protons at the 5-H position appeared as a doublet of doublet/triplet from δ 5.52-6.26. The pyrrole protons at the 3-H and 4-H positions appeared as a triplet from δ 6.38-6.41 ppm and those protons at the 2-H and 5-H positions resonated as triplet/multiplet from δ 7.06-7.17 ppm. The 13C NMR spectra exhibited characteristic signals of carbonyl carbon atom in the range of δ 159.87-163.96 ppm. The mass spectra showed a precise molecular ion peak data for the respective compounds. Scheme 1. Synthetic route of novel series of pyrrolyl carbaldehyde derivatives. Anti-TB activity was determined for compounds 4(a-o) against M. tuberculosis strain H37Rv by a microplate alamar blue assay (MABA) using pyrazinamide and streptomycin as reference drugs and these results are depicted in Table 1. The initial anti-TB evaluation showed that majority of compounds exhibited moderate to good activity. The activities of compounds 4(a-o) are expressed in terms of MIC values. Compound 4i showed the highest activity with a MIC value of 3.125 µg/ml, while compounds 4g and 4h showed better activity with a MIC value of 6.25 µg/ml. A good anti-TB activity is due to the presence of pharmacologically active hetero-aryl pyrazoline ring with formyl group. Certain therapeutic properties are to be determined to examine the antimycobacterial potential of a drug. Toxicity is one of these criteria. Hence, we have investigated the potential toxicity of eight selected pyrrolyl derivatives (4b, 4h, 4i, 4j, 4l, 4m and 4n) towards A549 (lung adenocarcinoma) cell-lines up to concentrations of 100 µg/mL. These compounds showed a moderate cytotoxicity compared to paclitaxel (see Table 2). Specifically, the most potent compounds viz., 4j and 4l exhibited a good safety profile as their IC50 value were 70.36 and 71.07 µmol/L, respectively against A549 cell-line. 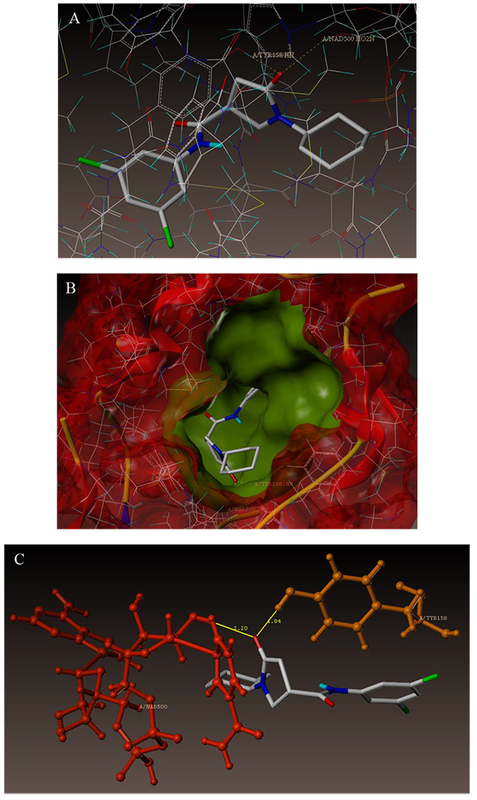 To examine the mechanism of anti-TB activity and to understand the comprehensive intermolecular interactions between the synthesized compounds and the enzyme, molecular docking studies were performed on the crystal structure of M. tuberculosis enoyl reductase (InhA) complexed with 1-cyclohexyl-N- (3,5-dichlorophenyl)-5-oxopyrrolidine-3-carboxamide (PDB ID 4TZK, 1.62 Å X-ray resolution) using surflex-dock programme of sybyl-X 2.0 software. Based on the greater level of resistance associated with INH isolates against InhA, docking studies were performed on InhA complex with 1-cyclohexyl-N-(3,5-dichlorophenyl)-5-oxopyrrolidine-3-carboxamide, which indicates the presence of drug-receptor interactions. All the 15 inhibitors were docked into the active site of ENR as shown in Figs. (2A and B). The predicted binding energies of the compounds are listed in Table (3). Superimposition of compounds 4i and 4g with ligand of 4TZK is depicted in Fig. 3. Table 3. Surflex dock scores (kcal/mol) of pyrrolyl carbaldehyde derivatives. * Astrisk indicates the compounds with better docking score. a CScore (Consensus Score) integrates a number of popular scoring functions for ranking the affinity of ligands bound to the active site of a receptor and reports the output of total score. b Crash-score revealing the inappropriate penetration into the binding site. Crash scores close to 0 are favourable. Negative numbers indicate penetration. c Polar indicating the contribution of polar interactions to the total score. d D-score for charge and van der Waals interactions between the protein and the ligand. e PMF-score indicating Helmholtz free energies of interactions for protein-ligand atom pairs (Potential of Mean Force, PMF). f G-score showing hydrogen bonding, complex (ligand-protein), and internal (ligand-ligand) energies. g Chem-score points for H-bonding, lipophilic contact, and rotational entropy, along with an intercept term. The interaction of 4TZK ligand with the enzyme depicted in Figs. (4A-C) shows that oxygen atom of carbonyl group present on pyrrolidine ring has two H-bonding interactions with the hydrogens of TYR158 and NAD+ (-C=O ------ H-TYR158, 1.84 Å; H-NAD+, 2.20 Å). As depicted in Figs. (5A-C), the oxygen atom of formyl group present at the 2nd position of pyrazoline ring of compound 4i exhibited two H-bonding interactions with the hydrogens of TYR158 and NAD+ (-CHO ------ H-TYR158, 2.22 Å; H-NAD+, 1.99 Å), while the oxygen atom of -OCH3 present at the 4th position of aromatic ring makes H-bonding interactions with MET98 (-OCH3 ----- H-MET98, 1.98 Å). In Figs. (6A-C), the oxygen atom of formyl group present at the 2nd position of pyrazoline ring of compound 4g makes two H-bonding interaction with the hydrogens of TYR158 and NAD+ (-CHO ------ H-TYR158, 2.21 Å; H-NAD+, 2.01 Å), while the oxygen atom of -OCH3 present at the 4th position of aromatic ring exhibited H-bonding interaction with MET98 (-OCH3 ----- H-MET98, 1.92 Å). On the other hand, hydrophilic (SER94, SER123, SER20, NAD500, SER19, THR196, ARG195, GLN100, GLN216, GLN214, GLU219, TYR158, ASN159, THR162, ASP150, LYS165, ASP148) and hydrophobic (GLY96, PHE97, MET98, PRO99, TRP160, MET161, ILE21, MET199, ALA157, PRO156, ILE215, ILE194, PRO193, PHE149,ALA198, LEU197) amino acid residues surrounded over the representative compound 4i are represented in (Figs. 7A and B). Fig. (2). (A) Docked mode of all molecules; (B) Inside the proposed binding pocket of InhA. Fig. (3). Orientation and superimposition of active analogs 4i (red) and 4g (yellow) over 4TZK crystal ligand (purple). Fig. (4). (A) Docked mode of 4TZK_ligand; (B) Inside the proposed binding pocket of InhA; (C) 3D docked view of the 4TZK_ligand. Binding site residues; red colored Try158 amino acid, blue colored co-factor NAD+ and the molecule is colored according to atom type. All the compounds showed consensus scores in the range of 9.05-2.65, indicating the summary of all forces of interactions between ligands and InhA. Charge and van der Waals interactions between protein and ligands varied from -77.96 to -168.11. Helmholtz free energies of interactions for protein ligands atom pairs range between -33.56 and -66.28. However, its H-bonding, complex (ligand-protein), and internal (ligand-ligand) energies range from -151.65 to -285.29, while those values of -25.78 to -45.80 indicate the ligands due to H-bonding, lipophilic contact, and rotational entropy as well as intercept terms. These scores indicate that molecules preferentially bind to InhA in comparison to reference 4 TZK ligand (Table 3). In general, it is observed that -OCH3 and CHO groups make the H-bond at substrate binding site and the presence of electron donating or withdrawing substitution on the aromatic ring attached to pyrazoline moiety may be helpful to show the activity, while those of pyrrole and pyrazoline moieties help to occupy or penetrate the molecule at the active sites. Fig. (5). 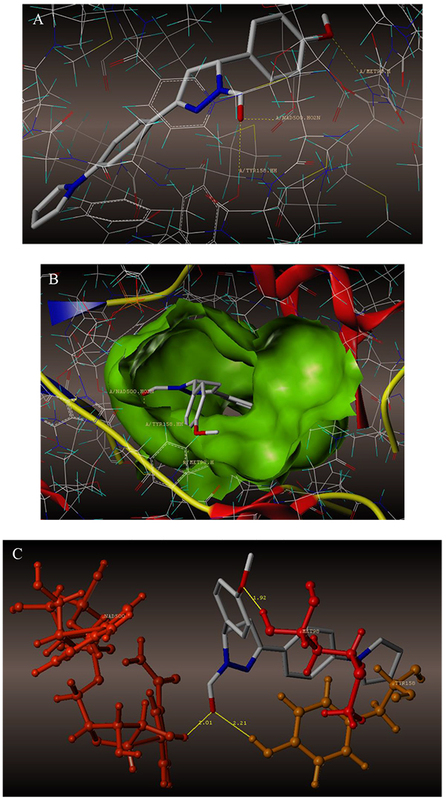 (A) Docked mode of compound 4i; (B) Inside the proposed binding pocket of InhA; (C) 3D docked view of the compound 4i. Binding site residues; red colored MET98 amino acid, orange colored TYR158 amino acid, red-orange colored co-factor NAD+ and the molecule is colored according to atom type. The Lipinski’s ‘rule of 5’  was calculated for compounds 4(a-o) to evaluate their drug likeness property, which in general states that an orally active drug did not have more than one violation viz., (i) no more than five H-bond donors, (ii) molecular weight < 500 daltons, (iii) cLogP not > 5, and (iv) no more than 10 H-bond acceptors . We have calculated theoretical cLogP, molecular weight (MW) and number of H-bond donors and acceptors using Sybyl-X.2.0. Examination of the results summerized in (Table 4), suggests that compounds 4(a-o) satisfied the range of physicochemical parameters established by the Lipinski’s rule. Fig. (6). 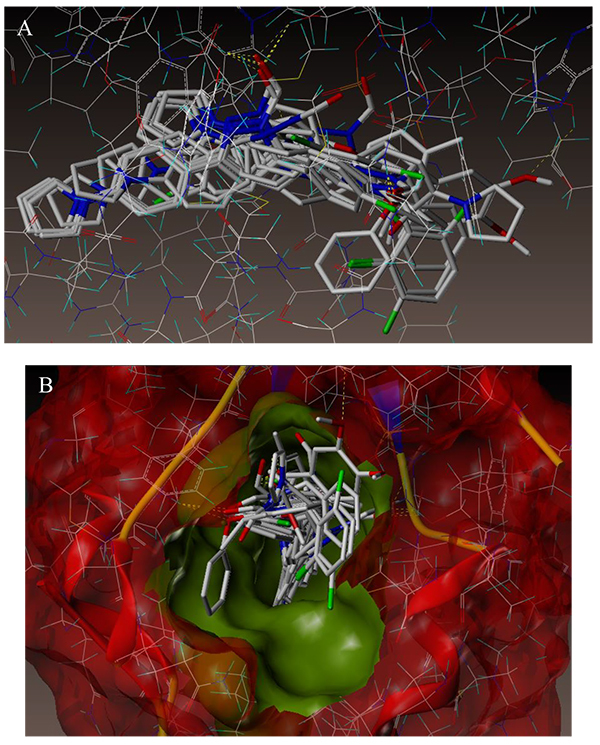 (A) Docked mode of compounds 4g; (B) Inside the proposed binding pocket of InhA; (C) 3D docked view of the compound 4g. Binding site residues; red colored MET98 amino acid, orange colored TYR158 amino acid, red-orange colored co-factor NAD+ and the molecule is colored according to atom type. Fig. (7). (A) Hydrophilic and (B) Hydrophobic amino acids surrounded to representative compound 4i. Table 4. QSAR parameters: cLogP, molecular weight (MW), number of H bond donors and H bond acceptors value for compounds 4(a-o). In this study, novel compounds 3-(4-(1H-pyrrol-1-yl)phenyl)-5-substituted phenyl-4,5-dihydro-1H-pyrazole-1-carbaldehydes 4(a-n) and 3-(4-(1H-pyrrol-1-yl)phenyl)-5-(furan-2-yl)-4,5-dihydro-1H-pyrazole-1-carbaldehyde (4o) have been synthesized that were recognized as potent InhA inhibitors by in silico studies. These pyrrole derivatives were further explored in search of novel anti-TB agents, identifying several derivatives with the reasonable inhibitory activities against M. tuberculosis. Of all the compounds tested, compound 4i exhibited significant activity with a MIC value of 3.125 µg/mL and compounds 4g and 4h have displayed the MIC value of 6.25 µg/mL with no apparent cytotoxicites towards human lung cancer cell-line (A549). This indicates non-toxic behaviour of chemophores and hence, they may be considered for further structural modification. Molecular docking was performed to understand drug-receptor interactions. The results have shown that the compounds are mainly bound to the substrate binding site of InhA and the scoring function for most of the compounds is similar to that of the reference inhibitor. The anti-TB activity of these compounds was fully supported by in silico molecular docking calculations. The synthesized compounds were found to be useful as the lead compounds for further developing InhA inhibitors. Our future goal is to identify the mechanism of action and explore the pyrrole analogues, which might serve as a new template for further investigations amid selective and less toxic anti-TB agents to merit the cost effective and reduced treatment time. More studies are underway to improve their efficiency against InhA and M. tuberculosis. The authors acknowledge financial support from the Council of Scientific and Industrial Research, New Delhi, India (Letter No. 02(0139)/13/EMR-II dated- 12/04/2013). We thank Dr. H. V. Dambal, President, S.E.T’s College of Pharmacy, Dharwad, India for his support and Dr. K. G. Bhat of Maratha Mandal's Dental College, Hospital and Research Centre, Belgaum, India for providing anti-TB activities. Director, SAIF Panjab University, Chandigarh, Panjab, India has provided some of the NMR and mass spectral data. Cohen J. Medicine new TB drug promises shorter, simpler treatment. Science 2004; 306(5703): 1872. Dye C, Watt CJ, Bleed DM, Hosseini SM, Raviglione MC. Evolution of tuberculosis control and prospects for reducing tuberculosis incidence, prevalence, and deaths globally. JAMA 2005; 293(22): 2767-75. Cole ST, Alzari PM. Towards new tuberculosis drugs. Biochem Soc Trans 2007; 35(Pt 5): 1321-4. Heath RJ, Rock CO. Fatty acid biosynthesis as a target for novel antibacterials. Curr Opin Investig Drugs 2004; 5(2): 146-53. White SW, Zheng J, Zhang YM, Rock CO. The structural biology of type II fatty acid biosynthesis. Annu Rev Biochem 2005; 74: 791-831. Joshi SD, Dixit SR, More UA, Aminabhavi TM, Kulkarni VH, Gadad AK. Enoyl ACP reductase as effective target for the synthesized novel antitubercular drugs: a-state-of-the-art. Mini Rev Med Chem 2014; 14(8): 678-93. Banerjee A, Dubnau E, Quemard A, et al. Jr. InhA a gene encoding a target for isoniazid and ethionamide Mycobacterium tuberculosis. Science 1994; 263(5144): 227-30. Zhang Y, Heym B, Allen B, Young D, Cole S. The catalase-peroxidase gene and isoniazid resistance of Mycobacterium tuberculosis. Nature 1992; 358(6387): 591-3. Pan P, Tonge PJ. Targeting InhA, the FASII enoyl-ACP reductase: SAR studies on novel inhibitor scaffolds. Curr Top Med Chem 2012; 12(7): 672-93. Lu H, Tonge PJ. Inhibitors of FabI, an enzyme drug target in the bacterial fatty acid biosynthesis pathway. Acc Chem Res 2008; 41(1): 11-20. Heath RJ, Yu YT, Shapiro MA, Olson E, Rock CO. Broad spectrum antimicrobial biocides target the FabI component of fatty acid synthesis. J Biol Chem 1998; 273(46): 30316-20. Kuo MR, Morbidoni HR, Alland D, et al. Targeting tuberculosis and malaria through inhibition of Enoyl reductase: compound activity and structural data. J Biol Chem 2003; 278(23): 20851-9. He X, Alian A, Stroud R, Ortiz de Montellano PR, de Montellano O. Pyrrolidine carboxamides as a novel class of inhibitors of enoyl acyl carrier protein reductase from Mycobacterium tuberculosis. J Med Chem 2006; 49(21): 6308-23. López SN, Castelli MV, Zacchino SA, et al. In vitro antifungal evaluation and structure-activity relationships of a new series of chalcone derivatives and synthetic analogues, with inhibitory properties against polymers of the fungal cell wall. Bioorg Med Chem 2001; 9(8): 1999-2013. Ducki S, Forrest R, Hadfield JA, et al. Potent antimitotic and cell growth inhibitory properties of substituted chalcones. Bioorg Med Chem Lett 1998; 8(9): 1051-6. Joshi SD, Dixit SR, Kirankumar MN, et al. 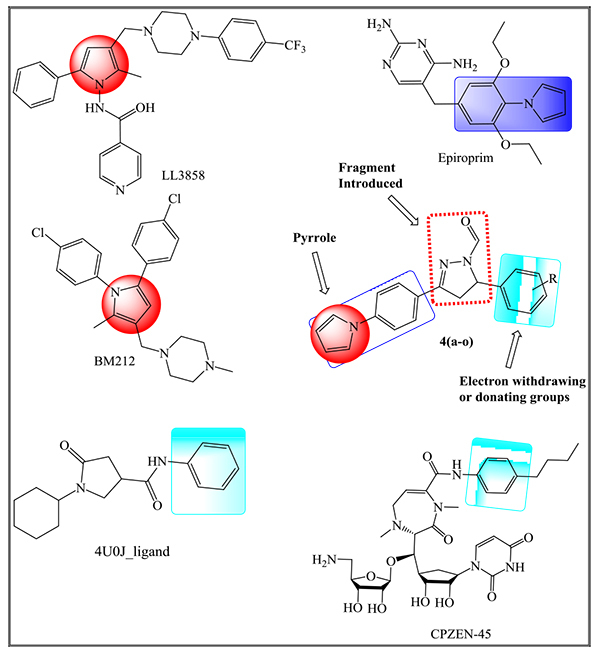 Synthesis, antimycobacterial screening and ligand-based molecular docking studies on novel pyrrole derivatives bearing pyrazoline, isoxazole and phenyl thiourea moieties. Eur J Med Chem 2016; 107: 133-52. Go ML, Wu X, Liu XL. Chalcones: an update on cytotoxic and chemoprotective properties. Curr Med Chem 2005; 12(4): 481-99. Parmar VS, Sharma NK, Husain M, et al. Synthesis, characterization and in vitro anti-invasive activity screening of polyphenolic and heterocyclic compounds. Bioorg Med Chem 2003; 11(6): 913-29. Joshi HS, Popat KH, Nimavt KS. Synthesis, anticancer, antitubercular and antimicrobial activity of 1-substituted-3aryl-5- (3′-bromophenyl)-pyrazolines. Indian J Heterocycl Chem 2003; 12: 225-8. Drabu S, Rana A, Kumar H. Synthsis, anti-inflammatory ulcerogenic and antibacterial activities of 1,3, 5-trisubstituted pyrazolines. Indian J Heterocycl Chem 2007; 16: 399-400. Johnson M, Younglove B, Lee L, et al. Design, synthesis, and biological testing of pyrazoline derivatives of combretastatin-A4. Bioorg Med Chem Lett 2007; 17(21): 5897-901. Secci D, Carradori S, Bolasco A, Bizzarri B, D’Ascenzio M, Maccioni E. Discovery and optimization of pyrazoline derivatives as promising monoamine oxidase inhibitors. Curr Top Med Chem 2012; 12(20): 2240-57. Yale H, Losee K, Martins J, Holsing M, Perry F, Bernstein J. Chemotherapy of experimental tuberculosis. viii. the synthesis of acid hydrazides, their derivatives and related compounds. J Am Chem Soc 1953; 75: 1933-42. Gazave JM, Buu-Hoi NP, Xuong ND. Tuberculostatic activity of isonicotylamino-I, dimethyl-2,5, pyrrol (G.144), a structural analogue of isoniazid. Therapie 1957; 12(4): 486-92. Joshi SD, Dixit SR, Kulkarni VH, Lherbet C, Nadagouda MN, Aminabhavi TM. Synthesis, biological evaluation and in silico molecular modeling of pyrrolyl benzohydrazide derivatives as enoyl ACP reductase inhibitors. Eur J Med Chem 2017; 126: 286-97. Joshi SD, Vagdevi HM, Vaidya VP, Gadaginamath GS. Synthesis of new 4-pyrrol-1-yl benzoic acid hydrazide analogs and some derived oxadiazole, triazole and pyrrole ring systems: a novel class of potential antibacterial and antitubercular agents. Eur J Med Chem 2008; 43(9): 1989-96. Biava M, Porretta GC, Poce G, et al. 1,5-Diphenylpyrrole derivatives as antimycobacterial agents. Probing the influence on antimycobacterial activity of lipophilic substituents at the phenyl rings. J Med Chem 2008; 51(12): 3644-8. Joshi SD, Dixit SR, More UA, et al. 3D-QSAR and molecular docking studies of 1, 3, 4-oxadiazoles containing substituted phenoxy fragment as inhibitors of enoyl-acyl carrier protein reductase from Escherichia coli. Med Chem Res 2014; 23: 4542-58. Joshi SD, More UA, Dixit SR, Korat HH, Aminabhavi TM, Badiger AM. Synthesis, characterization, biological activity, and 3D-QSAR studies on some novel class of pyrrole derivatives as antitubercular agents. Med Chem Res 2014; 23: 1123-47. Tripos International. Sybyl-X 20. St. Louis, MO, USA: Tripos International 2012. Clark M, Cramer RD, van Opdenbosch N. Validation of the general purpose tripos 5.2 force field. J Comput Chem 1989; 10: 982-1012. Jain AN. Scoring noncovalent protein-ligand interactions: A continuous differentiable function tuned to compute binding affinities. J Comput Aided Mol Des 1996; 10(5): 427-40. Jain AN. Surflex: fully automatic flexible molecular docking using a molecular similarity-based search engine. J Med Chem 2003; 46(4): 499-511. Kuntz ID, Blaney JM, Oatley SJ, Langridge R, Ferrin TE. A geometric approach to macromolecule-ligand interactions. J Mol Biol 1982; 161(2): 269-88. Muegge I, Martin YC. A general and fast scoring function for protein-ligand interactions: A simplified potential approach. J Med Chem 1999; 42(5): 791-804. Eldridge MD, Murray CW, Auton TR, Paolini GV, Mee RP. Empirical scoring functions: I. The development of a fast empirical scoring function to estimate the binding affinity of ligands in receptor complexes. J Comput Aided Mol Des 1997; 11(5): 425-45. Lourenco MC, deSouza MV, Pinheiro AC, et al. 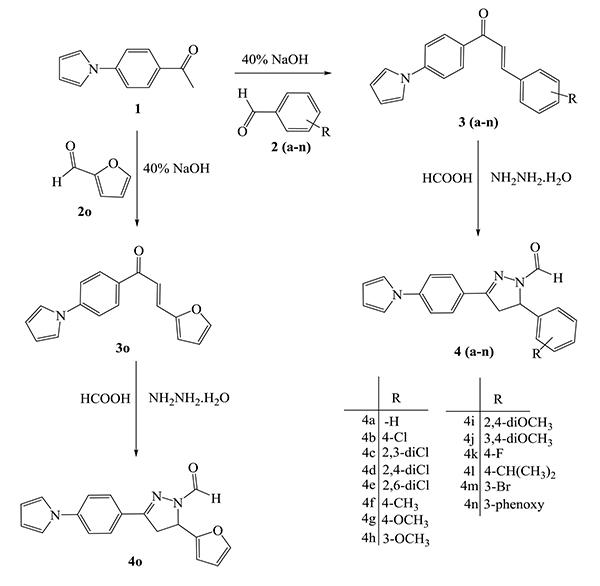 Evaluation of anti-tubercular activity of nicotinic and Isoniazid analogues. ARKIVOC 2007; xv: 181-91. Shah T, Joshi K, Mishra S, Otiv S, Kumbar V. Molecular and cellular effects of vitamin B12 forms on human trophoblast cells in presence of excessive folate. Biomed Pharmacother 2016; 84: 526-34. Lipinski CA, Lombardo F, Dominy BW, Feeney PJ. Experimental and computational approaches to estimate solubility and permeability in drug discovery and development settings. Adv Drug Deliv Rev 2001; 46(1-3): 3-26.